Yesterday, the New Hampshire Department of Education (NHDOE) issued a press release announcing Signum’s approval from the Higher Education Commission to offer classes in New Hampshire. This is an exciting milestone in the ongoing saga of acquiring the credentials Signum needs to grow further, and it’s a signal that we are moving in the right direction. Of course, behind this achievement are many hours, days, weeks, months and years of hard work and dedication by our entire Signum and Mythgard communities. Throughout spring and summer, Signum’s Board, Strategy Team, staff, faculty, and volunteers continued to work toward building and solidifying the tools, processes, policies and procedures, financial models, technology, and various other requirements to receive approval. Much of this work had to be completed by July 17th, 2018, the day of our “site visit” with the Higher Education Commission. Given our status as a fully online university, the site visit posed some unique challenges, but with the help of NH-based staff members Sparrow Alden and Jessi Robinson, who joined Dr. Olsen in person at the NHDOE offices, as well as a number of others who joined virtually using our Netmoot software, we were able to successfully communicate our vision and show how we could meet the rigorous standards set by the Higher Education Commission in a new and unique way. Of course, as is so often the case with bureaucratic processes, there were a few additional things to button up coming out of the site visit, some of which Dr. Olsen spoke about during his State of the University address in the fall. Since then, Signumites the world round have been working toward finalizing those details. Publication of yesterday’s press release by the NHDOE is a public acknowledgement that we have now fulfilled the last of those requirements. All of this has happened, of course, while continuing to grow our MA program and deliver one-of-a-kind classes. Among the new courses we’ve added since our site visit last summer include Eddic Poetry in Old Norse, the English Epic, and The Inklings & King Arthur (forthcoming)! We have also continued to expand our non-credit-bearing programs and events to include new regional moots, Mythgard programs, summer reading camps, and other educational activities. Receiving approval from the Higher Education Commission is wonderful, of course, but it is by no means an end point. While the NHDOE has given its approval for Signum to do business in the State of New Hampshire, we still need approval from the state legislature to grant degrees. The process for that next step has already begun with the introduction of a bill in the NH Senate, SB138 “relative to the degree granting authority of Signum University.” The bill was graciously introduced by Sen. David Starr and co-sponsored by Sen. Ruth Ward and Rep. Robert Forsythe. (If you’d like to reach out to thank them for their sponsorship of the bill, you can find state senator contact information here and state representative contact information here.) Upon introduction, the bill was referred to the Education and Workforce Development Committee, but it has not yet come up for consideration by the committee. We will be sure to share information about the bill as we become aware of it! In the meantime, progress is continuing toward other credentialing activities, including our efforts to seek accreditation. As we were doing last year in preparation for NHDOE approval, now the Signum Board, staff, and faculty are poring through accreditation documentation to ensure we are compliant with the requirements – or updating things to become so. Image from New Hampshire Department of Education press release. 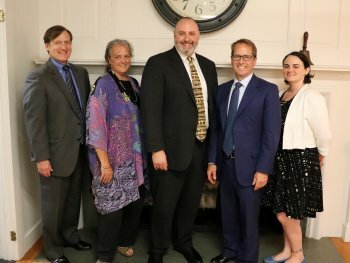 Right to left: Michael Seidel, director of the Division of Educator Support and Higher Learning, Laurie (Sparrow) Alden, classroom organizer and student support for Signum, Corey Olsen, president of Signum, Frank Edelblut, the commissioner of the NH DOE, and Jessica Robinson, student support and records for Signum.